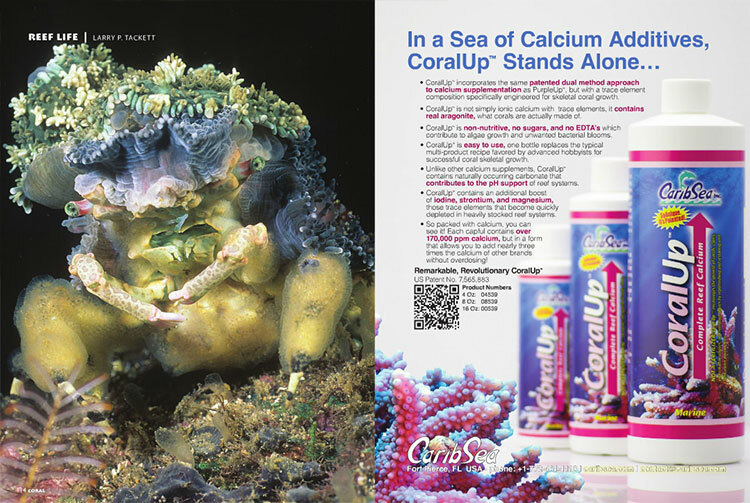 CORAL Magazine, March/April 2016 issue – Click cover to order a single copy direct from the publisher. 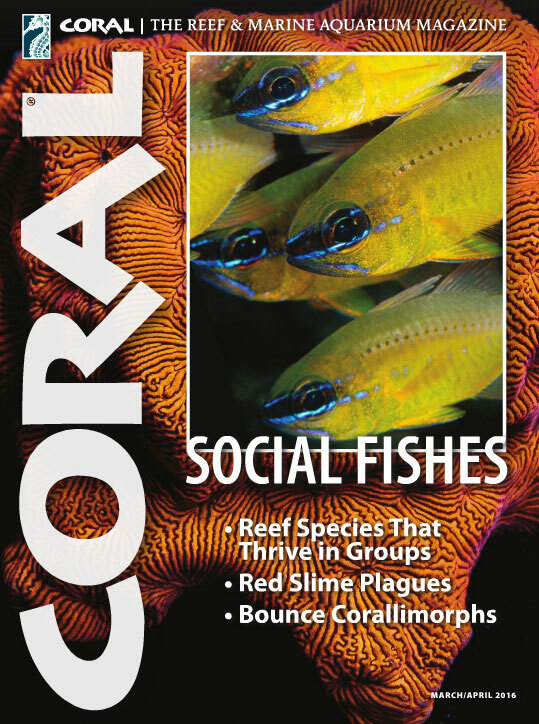 The March/April 2016 Issue of CORAL Magazine is printed and now delivering to print magazine subscribers and local aquarium shops. Here is a sampling of articles and opening pages for readers wondering what the issue will bring. 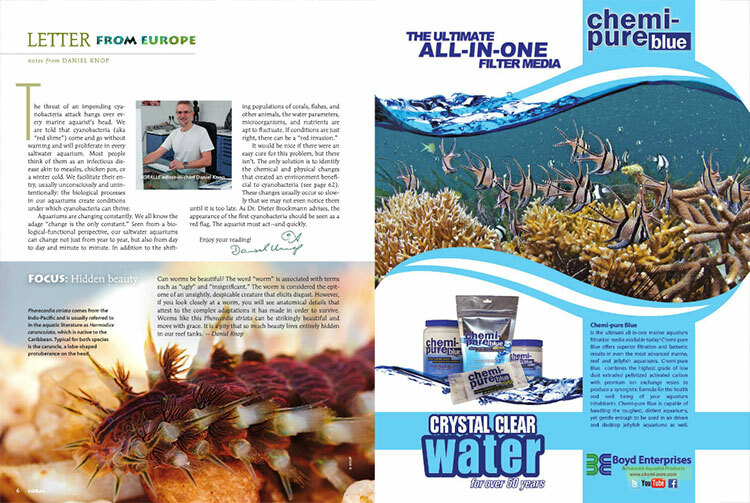 On sale date: March 8, 2016 at the best marine aquarium retail stores everywhere. 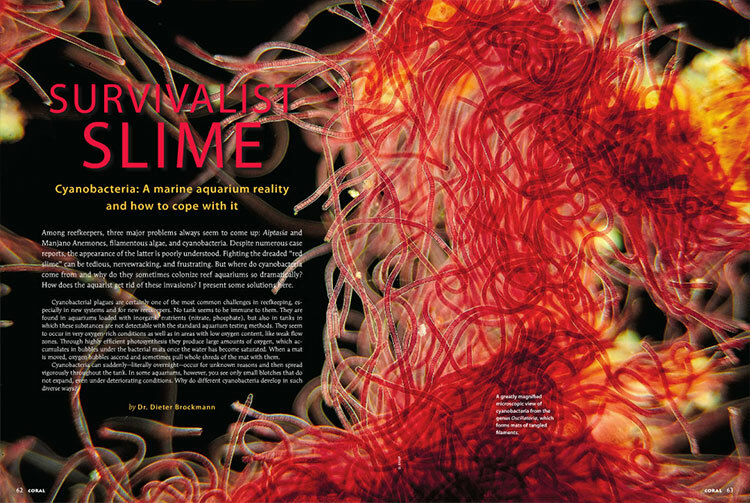 “The threat of an impending cyanobacteria attack hangs over every marine aquarist’s head,” starts Daniel Knop, introducing this issue’s coverage of cyanobacteria, known without affection as red-slime algae. Reef News kicks off with expanded coverage of Hawaii’s new Coral Restoration Nursery. 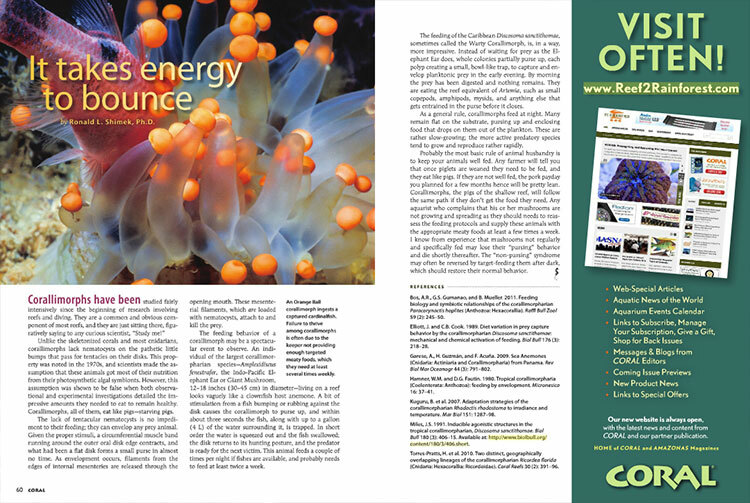 Additional stories include the announcement of a long-awaited captive-bred fish making its industry debut, gene exchange in aquariums, and aquariums as relaxants. News to know and discuss. 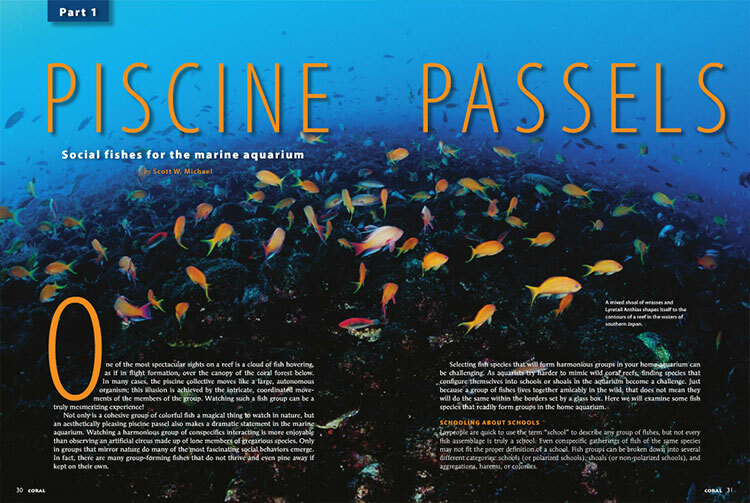 In Part 1 of “Piscine Passels”, Scott Michael shares the Chromis, Flagtails, Fusiliers, Cardinalfishes and Dartfishes that form groups in home aquariums. More to come in Part 2! 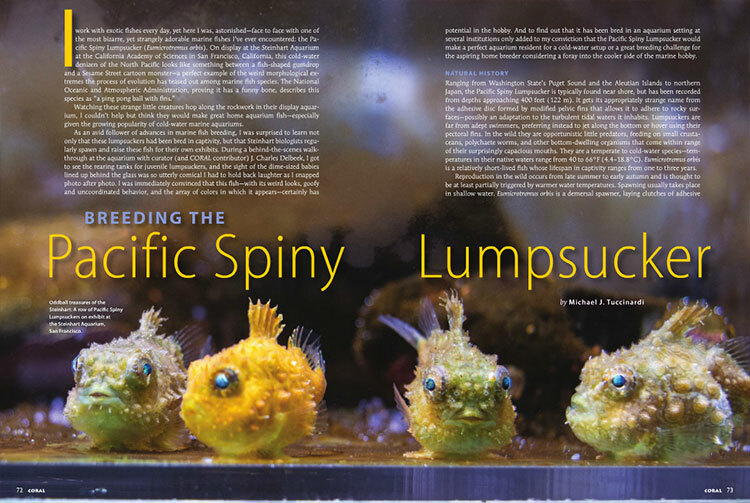 Senior Editor Michael Tuccinardi encounters the adorably cute Pacific Spiny Lumpsucker, a fish being bred at the Steinhart Aquarium, and a delightful species ideally suited for the coldwater marine reef aquarium. 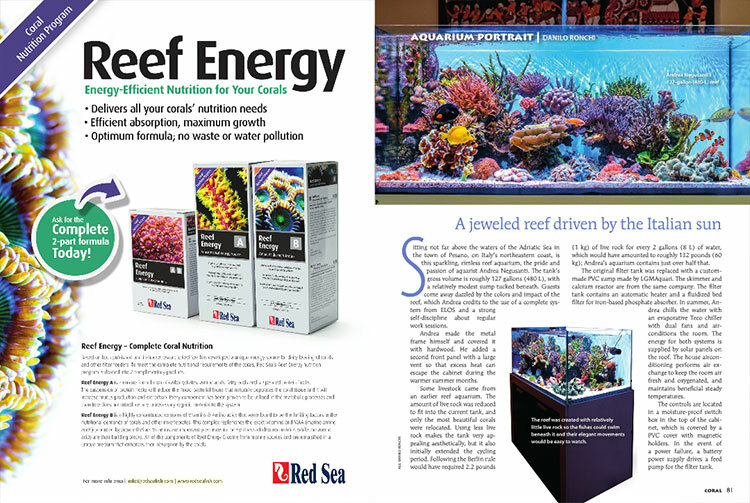 This issue’s Aquarium Portrait looks at a stunning 127-gallon reef aquarium on the Mediterranean coast maintained by Andrea Negusanti, as shared with us by Danilo Ronchi who covers cutting edge Euro-marine aquarium subjects. 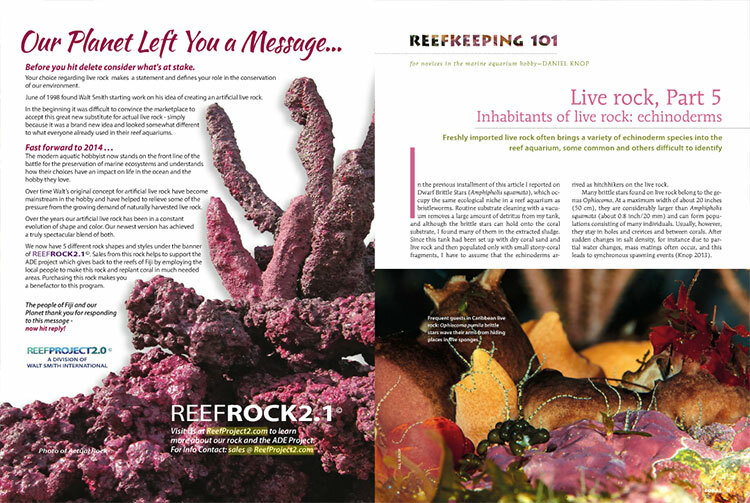 Reefkeeping 101 by Daniel Knop looks at a few common and very rare echinoderms that hitchhike their way into our aquariums. 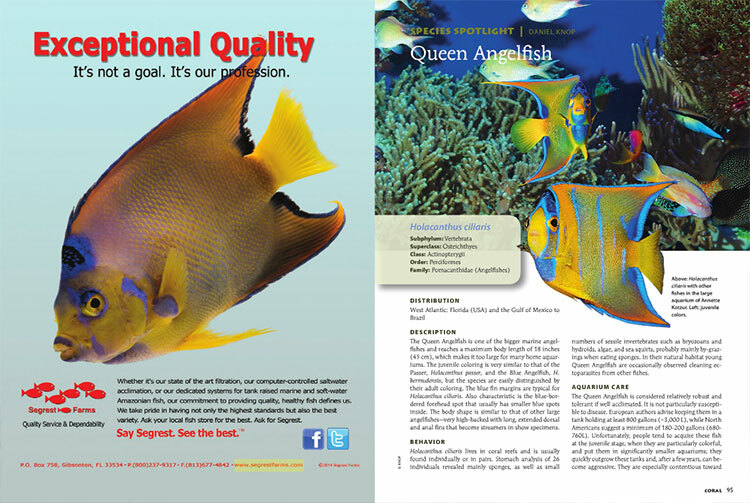 Daniel Knop looks at the iconic Queen Angelfish in this issue’s Species Spotlight. 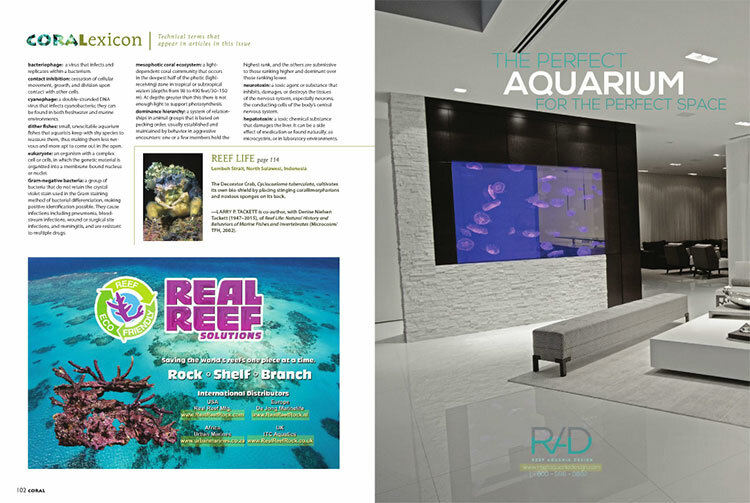 Looking for a great local aquarium shop? 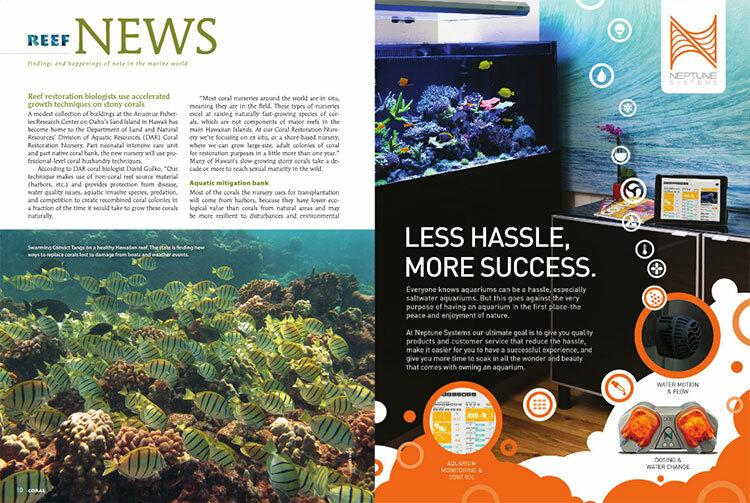 You’ll find some of the best happen to also sell CORAL Magazine! 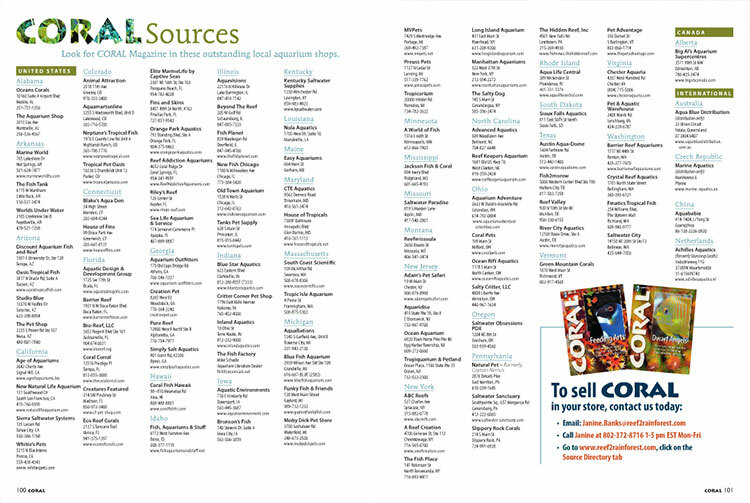 Check out our source directory, in print and online. Smart readers know that treasures often lurk in the back pages of each issue, from words that stump even experts to ads that should not be missed. 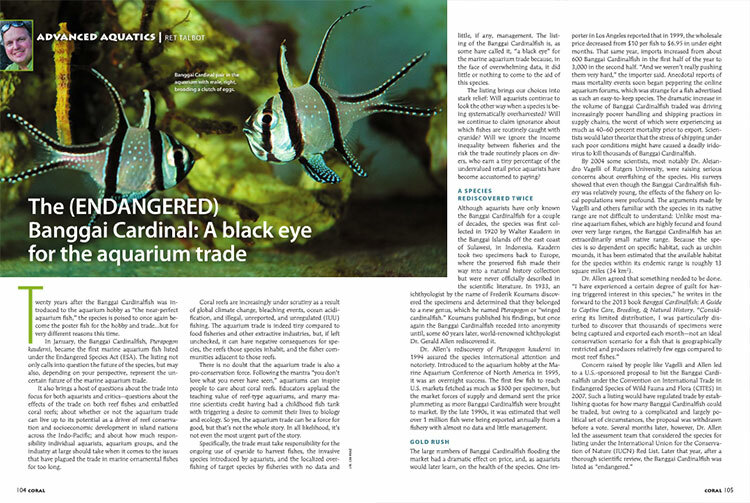 Ret Talbot examines the aquarium trade’s new “black eye” in the U.S. listing of the Banggai Cardinalfish as an Endangered Species. 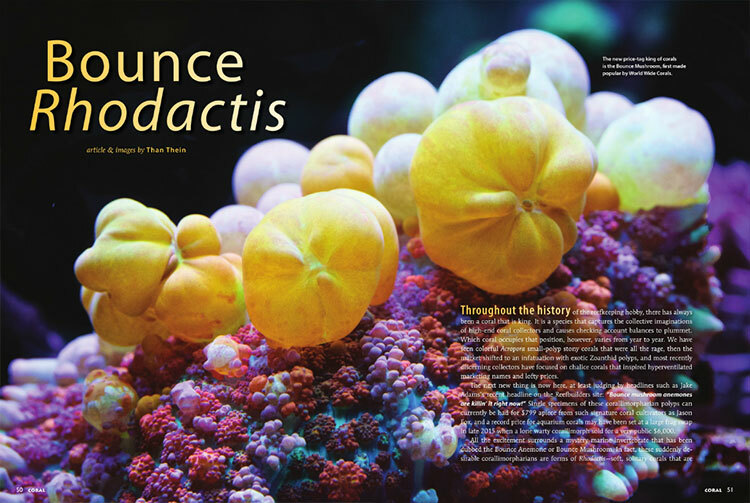 What exactly are you looking at in this issue’s Reef Life photo from veteran underwater naturalist Larry Tackett? Find the answer on page 102.